Feng shui tips 2018 are quick but efficient ways to arrange house or office for the year of the Dog according to flying stars 2018. 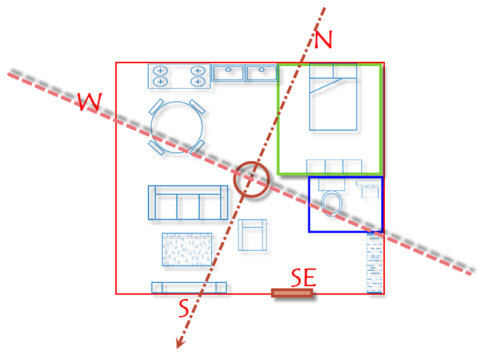 They include the information about feng shui bagua as well as feng shui enhancers and cures. The year of 2018 is the year of Dog. Although the traditional celebration of Chinese New Year starts on February 16th, 2018, the energy of 2018 starts on February 4th, 2018, Li Chun (the start of spring). The annual flying stars will relocate after this date. To ensure a year of safety, health, abundance and smooth sailing, one can stimulate the auspicious chi and suppress the ominous energy by re-arranging the feng shui enhancers and curers in the light of the new energy pattern in the house/office. Tai Sui (Grand Duke Jupiter) locates in the northwest region. Display Bejewel Pi Yao Seal in this corner and have it face southeast to appease Taisui (Grand Duke Jupiter). Suipo, the opposing energy of Taisui, will trespass the southeast region. Avoid any new construction in both southeast and northwest areas (Keep these two areas calm). The notorious Three Killings will affect most of north region (due north, northwest to north and northeast to north) in 2018. Alongside the Five Yellow in this region, the energy in the north this year is particularly unstable and troublesome. The chart below is the annual flying star chart for the year of Dog 2018. 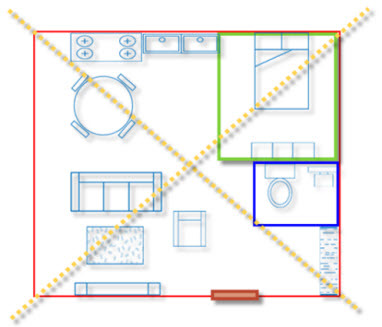 The chart divides the house (office) into 9 grids. South is on the top; north in the bottom; east on the left and West on the right, which is the opposite of the regular map. This chart tells you here a specific flying star will locate. Step Two: Slowly rotate your compass. Let the needle point to the due south/north (depends the version of your compass). Do your compass reading as the needle stays still. Flying star #7, implying theft, violence, injuries and loss, will trespass in the east region in 2018. It may sound untenable to have the property lost all of a sudden. Nevertheless, the most common case is, according to our experience, that we may lose value in our stocking market or housing market. Therefore, investing will be very careful. The star will always find certain way to drain one’s money and cause some injuries. East in original Babua belongs to Zhen Gua, which represents the eldest son and males between ages 30 to 45 years old, or the Chinese zodiac Rabbit. Hence, the eldest son, males between ages 30 to 45 years old, and Zodiac Rabbit are very likely to be affected by the menacing energy of Star #7. To secure your wealth, one can display Dragon Tortoise Totem with Rhino and Elephant in the east corner to weaken the ill-developing energy of #7. Besides respirational diseases, accidents related to extremities, and financial turbulence, one might also need to be aware of lawsuit and other personnel entanglement because the wood-metal element conflict. See NE position for cure. The wealth star #8 will locate in the southeast region in 2018. This auspicious star will bring one career luck and prosperity. Southeast in original Ba Gua belongs to Xun Gua, which implies the eldest daughter, widow, female between ages 30 to 45 years old, and the Chinese zodiac dragon and snake. Hence, the eldest daughter, females between ages 30 to 45 years old, or people who are Chinese Zodiac Dragon and Snake are very likely to benefit from the benevolent energy of Star #9. If the main door locates in this region or someone at your house belongs to Xun Gua (eldest daughter, widow, female between ages 30 to 45 years old, and the Chinese zodiac dragon and snake), one can activate the energy by displaying Red Victory Horse Keychain Amulet in the southeast region or by the main door. Nonetheless, in the Year of Dog, the southeast corner is also the Sui Po area, suggesting the unstable energy. One should also display Pair of Red Pi Yao to deflect the menacing chi of Sui Po and avoid heavy reconstruction in this corner. Display fire element and have it face northwest to minimize the effect of Sui Po. Since flying star #8 belongs to earth element one can display Red Bejeweled Wealth Bucket or Red Bejeweled Big Feng Shui Ingot in the southeast to stimulate the propitious energy of star #8. If one’s main door locates in southwest, displaying fire to activate the happiness energy. SW in the original bagua Belongs to Wood Element. If we use Earth Element to activate flying star #8, Earth Element will destroy Wood element which belongs to this area. It will conflict to this area. So it is better to choose Fire element to generate Earth Element. Star #9 is the star of bliss that signifies delight events, such as promotion, new start of enterprise, marriage and giving birth of new baby. Star #9 locates in the central region this year. 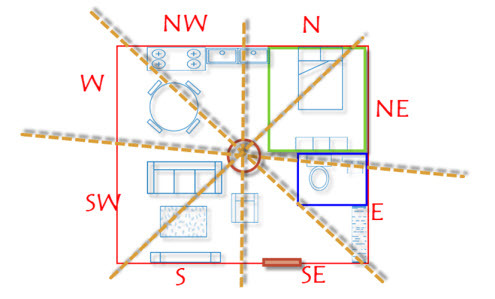 Generally, the star locates in the center has pervasive effect to every corner of a house, which makes the balance between fire element and other elements in the center very important. As the star of joy and happiness, star # 9 brings propitious energy for love, career and business. One can display Red Bejeweled Cloisonne Apple in the central region to stimulate the propitious energy of star #9. Star #1 locates in the northwest region. As the star of relationship, star #1 brings propitious energy for love, networking and business. Northwest region is Qian Gua in original Bagua whilst Qian Gua represents father, male household, males over 45 years old, Chinese zodiac Dog or zodiac Pig. Consequently, these groups of people and people whose main doors locate in NW should be benefited from the positive energy of #1. Flying start # 1 possesses auspicious water energy. Combining with the metal energy of northwest corner, they become the combo that is extremely positive for networking, career, finance and creativity. To stimulate this type of energy, one can display Bejewel Pi Yao Seal in this corner. Though the northwest corner is occupied by a lucky star, it is also the palace of Tai Sui(Grand Jupiter) and affected by Three Killings, which needs to be treated with care. Keep this area calm and avoid any kind of reconstruction in the northwest region. Use Bejewel Pi Yao Seal in this corner and have it faced southeast to appease the appease the overwhelming energy of Tai Sui. For those who are doing managerial or administrative work, northwest corner and southwest corners are essential areas to be activated in 2018. Note: Better to use Metal Element or Water Element in NW. If you use Tai Sui Plaque 2018 in this corner, you still need to add Metal Element in this area to boost auspicious flying star #1. Flying star #2, known as the star of illness, locates in the west region in 2018. West in original Ba Gua is Dui Gua, representing the youngest female, the third daughter, females under 15 years old, or zodiac rooster, etc. People who belong to the above category or whose main doors locate in the west should resonate more with the energy of star #2. Nonetheless, the trespass of star #2 in the west will result in digestive system problem, respirational illness, mouth ailment, and body discomfort especially of stomach, chest and throat, etc. Since star #2 belongs to earth element, one can display Wu Lou with Longevity God in the west region to weaken the illness chi caused by #2. Carrying Shakyamuni Buddha Pendant is also a great remedy to suppress the energy of star #2 in this region. Flying star #3 will trespass in the west region of the house. As one of the vicious stars, star #3 causes arguments, damage, lawsuit, etc. Northeast belongs to Gen Gua, representing the third son or the youngest son, or zodiac Ox or zodiac Tiger. Therefore, people who fall in these categories, or those whose main doors locate in the northeast should pay extra attention to the menacing effect of Star #3. The conflict between wood element of #3 and earth element of northeast will result in body discomfort, such as musical and joint pain, injuries on extremities, neurological illness, and also manifested through matters like lawsuits and accidents. One can display Ksitigarbha Fireball for Displaying to cure the menacing #3. Interfered by the earth energy of northeast corner, the wood energy is unstable and even more violent, not even mentioned the northeast is also affected by ominous energy of Three Killings. A great remedy to appease the conflict between earth and wood energy would be displaying Ksitigarbha Fireball for Displaying. The propitious star #4 locates in the south region. Well known for its enlightening and creative energy, star #4 is extremely beneficial for any art related work and education. If you stuck in work and struggle to come out with creative idea and solution, this is the right types of energy for you. South region belongs to fire element, Li Gua, which represents the middle-aged female, or the second daughter or females between 16 and 30 years old, or zodiac Horse, etc. The upbeat fire energy combine with wood energy is very beneficial for those who seek for scholastic luck, such as applying for Ph.D. bar examination, etc. Hence, people who were born in the zodiac sign of Horse, middle-aged female, or the second daughter or females between 16 and 30 years old, or have main door located in the south will resonate more with such positive chi. In order to maximize the auspicious chi of this creative, one can display 9-Level Green Pagoda in this area to create an inspiring and creative vibe. Star #5, known as the notorious Five Yellow, locates in the north region of the house. Five Yellow belongs to earth element. It possesses the most unstable energy of entire flying star family and always brings about vicissitudes and accidents to life. To make the things more complicated, Three-killings also trespass the north region this year, which makes the energy of Five Yellow even more intimidating. As a result, the north region should be kept calm and avoid any reconstruction and remodeling. North in the original bagua symbolizes the second son, zodiac Rat, or the male between 15 and 30 years old. As a result, people who were born in the zodiac sign rat, second son, or the male between 15 and 30 years old, or whose main door locates in the north region might be vulnerable to the menacing effect of Five Yellow and Three-killings. To mollify the menacing energy of Five Yellow, one can display 5 Element Pagoda in this corner to decrease the effect of the flying star #5. In the meantime, Three-killing, which needs Wood element to diminish its energy, is also located in this area. We need to display 3 pcs of Green Elephants for Three killings. However there is missing one mediator between them since metal element will destroy wood element. Therefore we still need to put one Round Blue Crystal Ball here to smoother them. If your main door locates in north corner, it is very important to pay attention to this ominous star, especially in the winter and summer season. Note: It is very complicated in North position in 2018 since both flying star #5 and three killings are in this location. We need to use Metal 5 element pagoda to lower down the effect of flying star #5 and “3 pcs of Green Elephants” as wood element for Three Killing. However these two cures are conflicted each other. Therefore we need one more Water Element to ,et this area be harmony (Don’t use windchime and water fountain). Star #6, known as the career star, will visit the Southwest region this year. Representing career, promotion, benefactor, actions and positive changes, #6 is one of most eminent stars in the nine-star family. Southwest in the original Ba Gua represents mother, female household, female over 45 years old, Chinese zodiac Ram and zodiac Monkey. As a result, people who fall into the above categories, or whose main door locates in the north region might be more benefited form the propitious energy of #6. For those who strive to pave a road to success, southwest region is the right spot to activate with proper tools. One can display 6 Metal Emperor Smooth Coins in this region to stimulate the propitious energy of #6. To enhance promotional luck, one can also display one White Horse in this region. Hi, those are amazing tips, thanks!! So why a water fountain cannot be placed on the north? I am an Ox and I was thinking to strength this area by placing a metal water fountain. Besides Tai Sui is NW close to North, Three Killings is in North position. Therefore it is better to keep this area calm. If you have water fountain, it is better to display it in SW position in 2018 year of the dog.